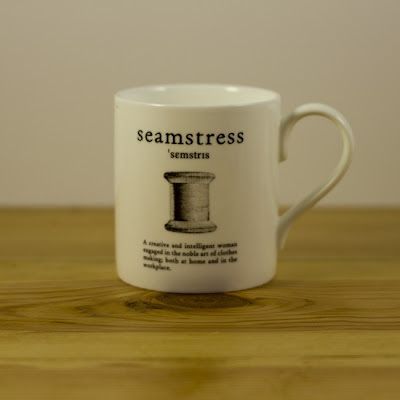 From The Village Haberdashery, a 'Seamstress' mug. "A creative and intelligent woman engaged in the noble art of clothes making; both at home and in the workplace." A while back there was a debate on somebody's blog about the preferred term for us stitching types. 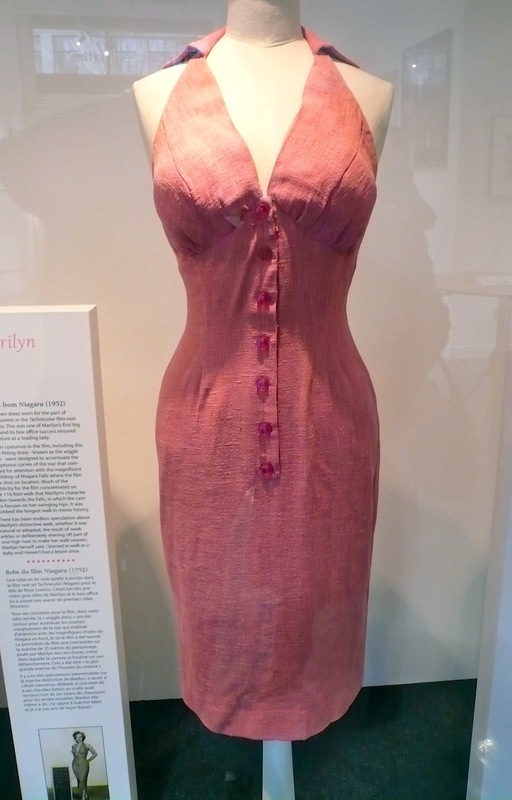 Lots of people objected to the term seamstress on the grounds that it was old fashioned, female specific and implied that you only sewed as a profession. I wasn't one of those people and proudly hold my hand up as a fan of the term, it just sounds so lovely when you say it and who could object to the description on the mug? ALL sewing related tea and coffee will now be taken from it. Now as soon as I saw Scruffy Badger's vintage pattern lady brooch recently, I knew I HAD to have one. They're made by Zoe and available through her Etsy shop ladybirdlikes and they don't really need any explanation, aren't they just awesome?! Of course, I chose a brunette wearing a spotty red dress, although if there'd been a blonde one, I'd have gone for her instead - I love the idea of wearing a little vintage-style mini-me brooch. 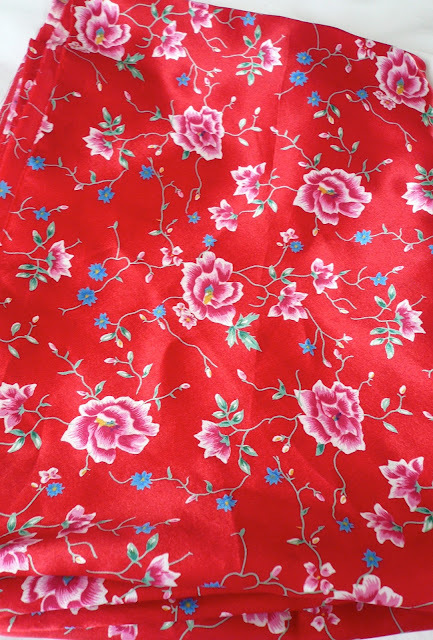 and two metres of this boudoir-style slinky red fabric. It's a bit over the top for a dress, but maybe a dressing gown? 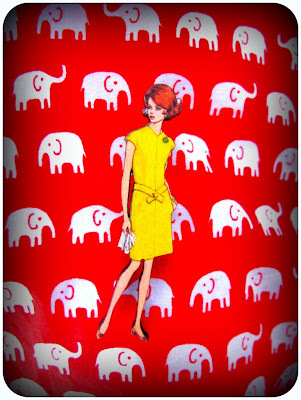 Or a fabulous, unexpected lining? And last, but by no means least, look at my fab new sweatshirt made for me by Zoe. I fell in love with her grey version after seeing it on this post. I asked if I could commission her to make me a navy version and because she's a darling, she agreed. It's beautifully made, fits like a dream and I LOVE, LOVE, LOVE it. In fact, five minutes after ripping it out of its envelope and putting it on, I received a compliment on it when I answered the door. It's a little too warm to wear at the moment (can't believe I just typed that after my recent whining about the weather), but I can see it being worn to death once the cooler weather arrives. 1) I've only got the exact amount of fabric specified on the pattern, so no room for mistakes. 2) I've never made a halter neck of any description. 3) I've never actually sewn with a Vogue pattern before - I'll be using V8727 - so have no idea how their sizes run. In my experience, Simplicity run large, as do McCall's and New Look (to a lesser extent). I don't think I've ever used a Butterick pattern before either, so can't comment on their sizes. I'd be interested to know though. For once, I erred on the side of caution and made up my muslin in the correct size for my measurements (size 14). The fit was fine, plus there's a certain amount of leeway with a halter neck as it can always be hoisted up if necessary! I will say this about the pattern though, because of the gathering around the bust, I suspect it's an easier fit if you've got a reasonable sized bosom to fill the bodice with. I did try it on my actual body as well as the dummy, but calico and deathly pale flesh isn't the prettiest sight, so I'd thought I'd spare you that ordeal. As Sunni said in a recent post "nobody looks good in muslin!" In my mega sulk on the subject, I even wondered whether to start work on my autumn wool jacket as it's more weather appropriate. I may still stick to this plan (or at least make a start) as I think I need to take my time on this make. I'm using the Abbey Coat pattern by the way, has anybody made it? Any tips? First up is this off-white polka dot linen blend which I found at the bottom of a scrap bin at a vintage fair. 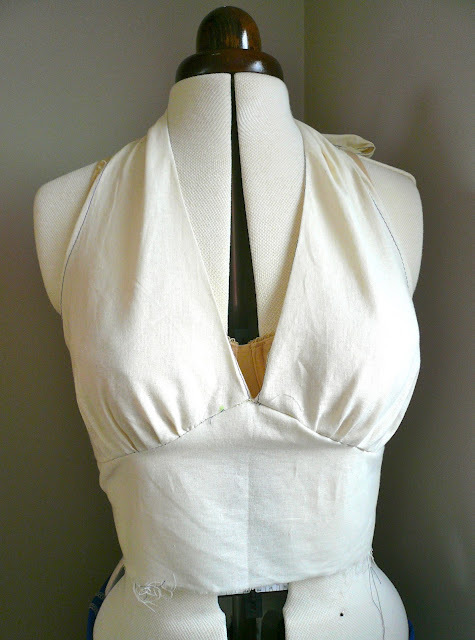 I plan to make my own version of a strappy 1950's sundress using Casey's tutorial. I want to use black bias binding as a contrast trim, blatantly copied from Karen after seeing her lovely Sorbetto. I've already worked out the bodice block, I just need to see what kind of skirt I can make out of the fabric. 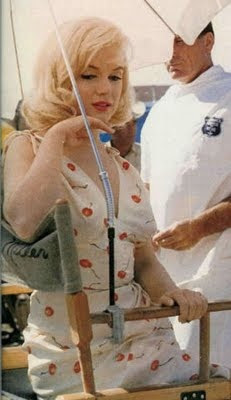 Secondly is a cherry print halter neck dress, inspired by Marilyn Monroe's dress from The Misfits. Actually, having laid my plans bare has made me want to sew the dresses even more. What do you all do in this situation? Do you just sew what makes you happy, regardless of whether it's going to be worn straight away or not? Or do you dutifully sew what's appropriate for the season and weather? I know that the process of making them and finishing them will make me VERY happy, so my instinct is to just sew them anyway and not give a monkeys about the weather. I'll still have two lovely dresses for next year, should the sun decide to shine at all. Sometimes, I think how a finished garment makes you feel is more important than how wearable it's going to be. Please chip in, I'd love to hear your thoughts on the matter. And finally, one thing that made me feel totally cheery and summery (despite the evidence outside my window yesterday) was seeing this beautiful dress by Roisin, posted here. *If there are any David Bowie fans out there (and I know for a fact that there are! ), check out this post and accompanying photos my husband Jon wrote for the Getty Images Archive blog. I LOVE the fact that the great man dons a full Ziggy Stardust outfit to do the decorating in! It's moment of truth time… did my finished shirt dress make me resemble the old frump on the front of McCall's 4769? Or did it not? Well, despite the horror of the front cover, I can confidently claim that McCall's 4769 is a queen amongst patterns, and damn near perfect for a shirt dress. As a couple of commenters pointed out on my last post, the pattern has great bones and I think it's this factor that really carries it. I was looking for a knee length, short sleeved shirt dress and view C was exactly that. The cut is deceptively simple, but very flattering. When it came to cutting the dress out, I'm afraid my sewing slapdashery spiralled completely out of control. The fit on the cover model looked a bit looser than I wanted, so for a tighter fit, I disregarded the size I should have cut out (a 14) and cut out a size 12. I used the petite shortening option on the skirt section, but not on the bodice pieces. My reasoning was that I'd need the longer bodice to accommodate my bust, especially as I was cutting a size smaller than my measurements. I did a quick tissue fitting on one half of my dummy and everything seemed to be in the right place, so with fingers tightly crossed, I cut it out - no muslin required. 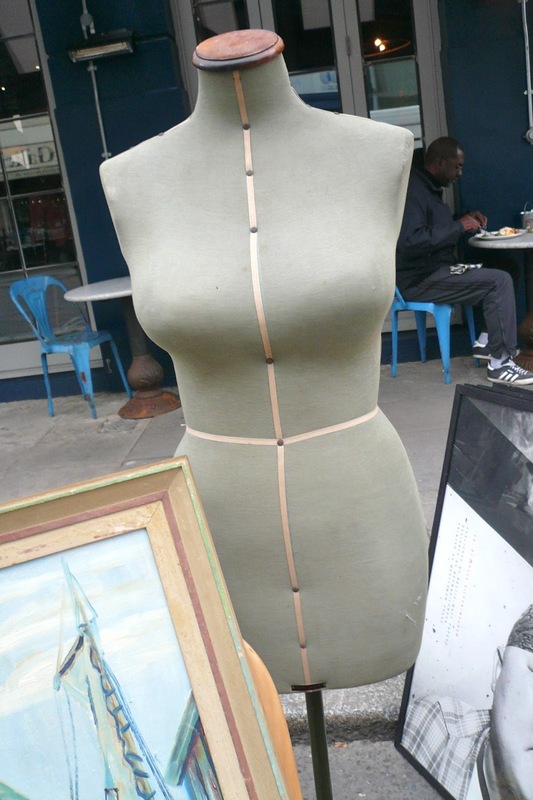 Yet again, the sewing gods were looking down on me that day, as the fit was positively glove-like. I did feel a bit guilty, especially after reading this post by Marie on the subject of making muslins (or not as the case may be). I think I'm just lucky.... for now. I only made a couple of tiny changes to the pattern. I left off the sleeve bands which just looked a bit bleurgh to me, and I removed the pockets, having first sewn them in place. For some reason they added quite a lot of unnecessary width to my hips, so out came the seam ripper and off they came. As a final touch, I added larger than specified vintage red buttons and I think they make quite a difference to the look of the dress. It's such a lovely dress to wear, and has a really old fashioned feel about it that I just love. Now that I know it fits well, there's tons of potential to fiddle about with details such as collar and sleeves. In the meantime, if you want to vamp it up a notch, you can always cinch it in at the waist with a waspie belt…..
As I was feeling in an old fashioned mood, I actually baked some scones to celebrate Queenie's 60 years on the throne (shock, horror!) Here I am in full domestic goddess mode, inching my way over to the mixer, determined to actually use it for a change! I used a scone recipe from the current issue of Vintage Life magazine and they turned out perfectly, even if I say so myself. I'm delighted to announce the winners of the vintage shirt dress patterns. 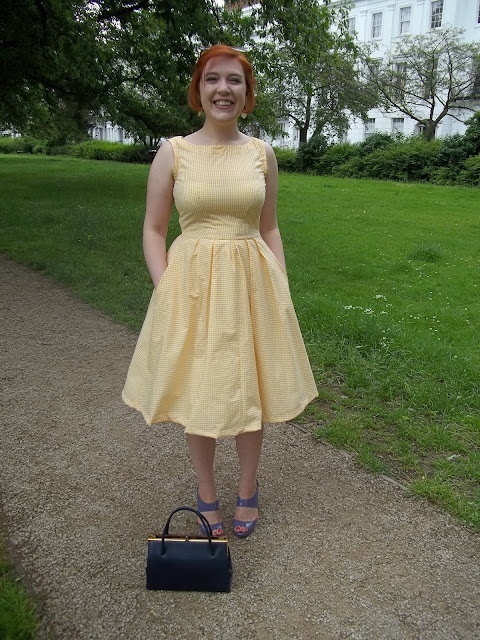 The winner of Simplicity 6700 is Kerry from Kestrel Finds and Makes! and the Maudella 5184 goes to Symon from Symon Sez! Congrats ladies, please e-mail me your addresses and I'll send them to you ASAP.